This index map is only provided by the Jackson County Surveyors office to assist in locating recorded county surveys. For questions or comments regarding the completeness or functionality of this map, please contact the Jackson County Surveyor’s office at 541-774-6191. Basemaps: You can choose a basemap in the upper right hand corner of the map or keep the default topographic map. Zooming and Panning: There are various ways to zoom. With the mouse wheel, scroll up to zoom in and scroll down to zoom out. Hold shift, click, and drag will create a zoom box. Double click. Use the zoom tools in the upper left hand side. You can similarly pan through the map using the mouse by clicking and dragging, or by using the tools in the upper left hand side. Searching: On the toolbar click the binoculars to open the search widget. Search by attribute or feature. 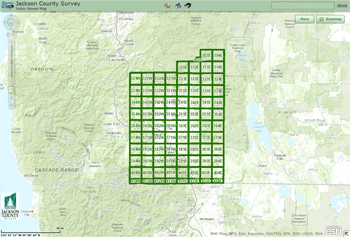 “Select feature” will allow users to click directly on the map to view information about selected surveys. “Select by attribute” will search the Jackson county database by specified search topics. In the search widget hover over the binocular that says “Select by attribute” or “Select feature” in the upper right corner, click on either of the binocular. In the search layer drop down menu click specified search topic (eg. map and taxlot). Click on search results to select and zoom to features. Go back to “Select by attribute” or “Select feature” and click clear to clear selected results. View Filed Surveys: After clicking on map to view survey information, scroll down to the bottom of the window where is says Survey PDF link in bold. Click on the “x” and the survey will open in a separate window. Printing: To print, click on the printer icon next to the binocular on the toolbar and add a title and subtitle if desired. Click print to go to your printers options. Additional Help: For more help options click on the “click here for help” link at the top center of the map once the map has been opened. Depending on your internet connection speed, the map will take a few moments to initially load. Please be patient.